The Helderberg Hilltowns of Knox, Berne, Rensselaerville and Westerlo comprise 40% of Albany County’s geographical area, yet they harbor less than 4% of its population. The Helderberg Escarpment is the major physical divide between the Hilltowns in the western part of the county and the “Flatlanders” living “below the hill” in the Hudson and Mohawk valleys. Albany County elevations range from sea level down by the Hudson River up to over 2,100 feet in the Helderberg Mountains. While the shores of the Hudson River will receive a fair amount of snow throughout the winter, the higher elevations will receive and, more importantly to the cross country skier, retain more snow for a longer period of time. Thankfully, there are numerous natural areas within the county, many of which are appropriate for exploration on skis. Here are three of my favorite wilder, ungroomed destinations suitable for the novice to intermediate skier as well as the snowshoer. Parking areas mentioned are often plowed soon after snowstorms. Situated below the escarpment at elevations in the 700 to 800 feet range, the Wolf Creek Falls Preserve is owned by the Mohawk Hudson Land Conservancy. This 135-acre preserve lies on both sides of Bozenkill Road (CR 253) in the Town of Knox, about four miles west of Altamont. Opened in the fall of 2007, the preserve was a gift of Steve Brown, a retired SUNY professor. Maps can be found at the kiosk in the parking area and on the MHLC website: mohawkhudson.org. Visitors will find over three miles of trails here. The parking area is on the south side of Bozenkill Road and the trails on this side are mostly easy skiing. The trails north of the road offer more scenic variety and more interesting skiing. I usually take the red trail down to the crossing of Wolf Creek. It would be nice to have a bridge here because the creek is usually not well-frozen over, but these streams just rage at times, even though most of the year they hardly even flow – and are easily forded. The changing climate has made the land conservancy pause before installing bridges, though it is inconvenient for visitors. If it’s not frozen there is no best way across. The nearby railroad corridor downstream looks like an option, however people are not allowed to trespass on it. There’s only about one train running a week, so the risk in minimal, but the railroad is very strict about not using it. Once on the other side, take a left on the blue trail that follows the creek upstream. When the blue trail climbs steeply away from the creek, you can follow the stream off-trail, up to the scenic 15-foot falls. The far wall of this mini gorge below the falls rises impressively 50 feet above the creek. When you are done with the falls, head back up the blue trail – note that skiing the blue trail in the other direction (downhill) is best for advanced skiers only. West of the falls, there are several loop options and some fun hills to ski. These trails tend to be fairly wide and smooth and do not need a lot of snow to be skiable – I’ve skied here on six inches of snow. 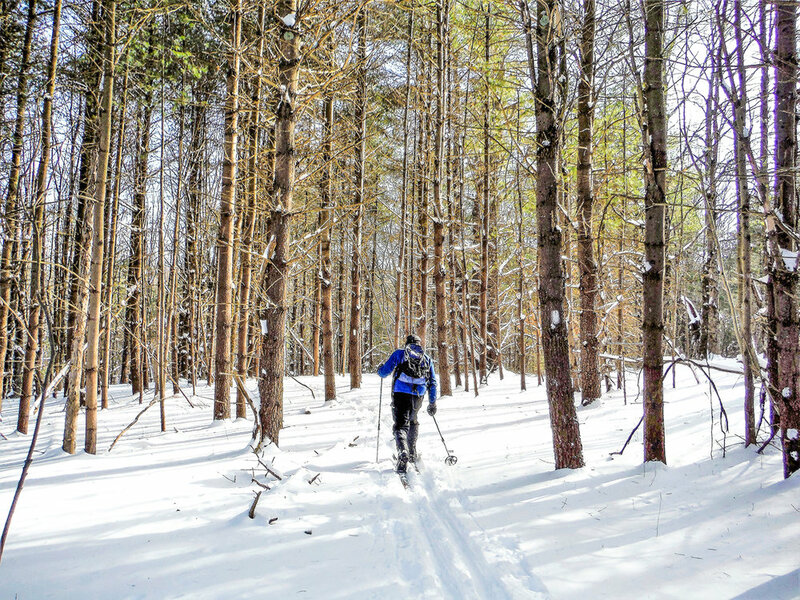 If you still want to ski more when done with this preserve, you can find more skiable trails at the nearby Bozen Kill Preserve, another one of MHLC’s preserves. The Huyck Preserve is a non-profit research organization located in the scenic hamlet of Rensselaerville. The preserve’s 12 miles of trails are spread out over 2,055 acres and lie between 1,600 to 1,900 feet in elevation. An excellent map can be found on huyckpreserve.org or picked up at the visitor center on weekdays. The best starting-off point for the skier is at a small parking area and kiosk on Pond Hill Road across the street from Lincoln Pond. From there, it is a short walk to the beginning of the Wheeler-Watson Trail, which climbs away from the road, and soon reaches a 19th century cemetery. On a clear day, you may get a view to the Catskills before reaching the flat Race Track, an old horse-racing oval. 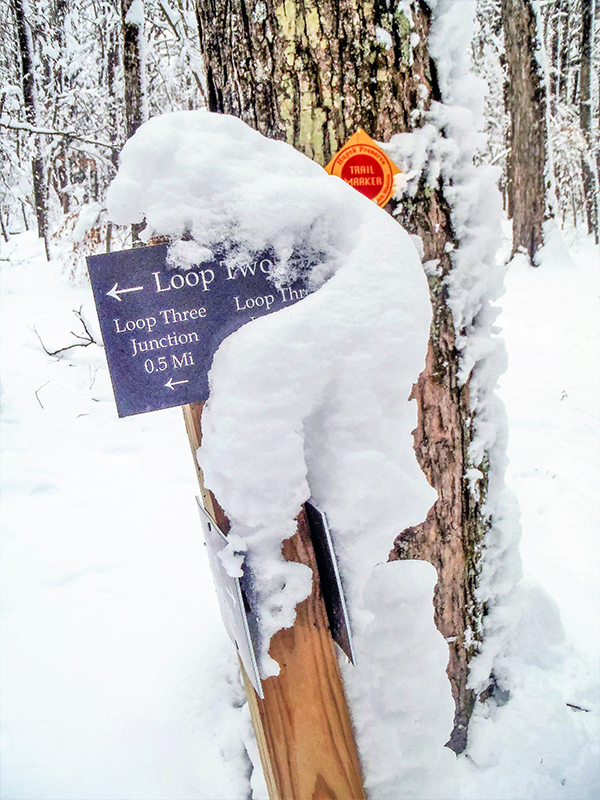 The Partridge Path’s three loops are the preserve’s newest trails and are ideal for skiing with plenty of ups and downs through open hardwoods with little understory. I especially love skiing the glade on the southwest side of Loop 2. The drop down the connector to Loop 3 can seem steep to some folks but there is plenty of space between trees to run out or cheat on the downhill run – advanced skiers may want to execute some Telemark turns through here. After crossing Ten Mile Creek on a good bridge, Loop 3 follows a scenic tributary for a time, crosses a power line and passes another possible access point. In winter, park at the junction of Peasley and Wood roads and ski 200 yards on unplowed Wood Road to the trailhead. If you do all three loops, you will likely travel over eight miles on the day. Whitetail deer are often seen bounding through the trees; I’ve also seen otter tracks and springtails (snow fleas) on warmer days. Another option from the Pond Hill Road parking area is to ski the West Lake Trail, which will take you down the west side of Lake Myosotis. This is novice terrain as long as there is more than a foot of snow to cover up some rough spots. A 0.3-mile spur trail will take you to the lake’s rock dam and spillway. The Falls Trail will get you to the top – the Waldron Overlook – and foot of the spectacular Rensselaerville Falls. It’s ideal for snowshoeing, but the skiing is very steep in spots and not recommended, except for expert skiers in the best conditions when there is more than a foot of snow. The 60-foot falls are a must-see but it is best to approach them from the visitor center on NY Route 85 by foot – or snowshoes if there is six inches or more of snow – before or after your ski tour. Partridge Run State Forest and Partridge Run Wildlife Management Area contain a combined 48 miles of trails over an area of 5,525 acres in the Town of Berne. Snowmobiles are allowed on many of the trails, but a few miles are dedicated as non-motorized ski trails. Elevations are in the 1,600 to 2,000 feet range. I normally start skiing from the junction of Sickle Hill Road (CR 13) and unplowed Beaver Road – make sure you are not blocking a private driveway when you park here. Ski down Beaver Road for 0.3 miles, and take a right past a gate onto the designated ski trail, which has yellow ski trail markers as well as blue foot trail markers. Pass through a field and you will soon see Hidden Pond on the right. After a long but easy downhill the trail makes a right turn – Becker Pond can be seen through the trees. The next section can have some wet spots if the weather has been on the warm side in recent days. The trail then climbs moderately. At the top of the climb, a spur trail to the right leads to a parking area on Bradt Hollow Road. Bearing left, the ski loop continues to a “T” intersection. Taking a left here brings you back down to Beaver Road for a round-trip distance of about 4.5 miles. Take a right if you desire a longer trip. After taking the right turn, you soon arrive at an old cemetery on Bradt Hollow Road; the headstones make for some interesting reading. The ski trail crosses the road and runs concurrently with a snowmobile trail down a hill, but you will likely be going too fast to notice the Long Path joining your route down. After a climb, take a right following Long Path markers through conifer woods. A beaver pond is seen on the left. 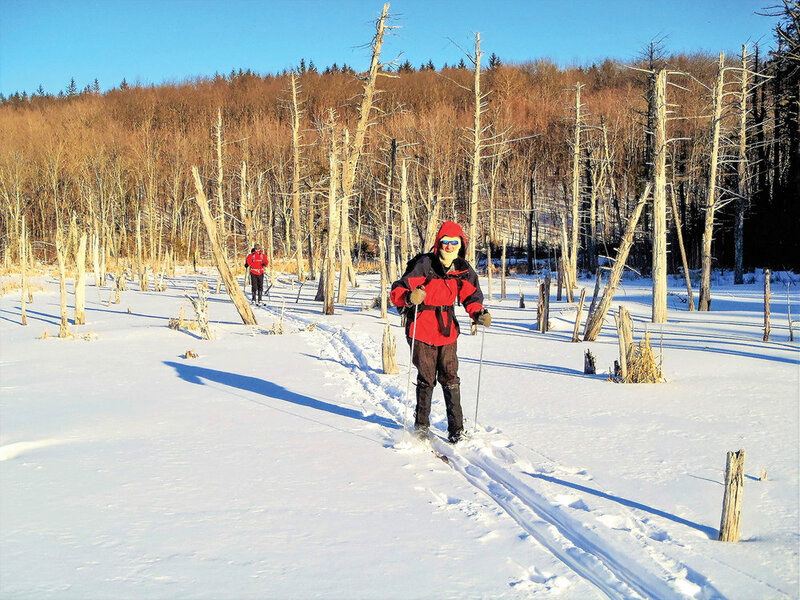 It may be easier and more scenic to ski out onto the beaver pond – if the ice is safe – and then pick-up the trail again at the far end of the pond. The trail then crosses High Point Road and makes a loop. After that, you can head back toward the start, following your tracks back to Bradt Hollow Road, and the trails beyond. Note that there has been some recent logging where the ski trail approaches Beaver Road (north of Woods Pond), and you may experience some “speed bumps” due to debris and waterbars. A map of the area can be found at dec.ny.gov/outdoor/86068.html. On the map, the ski trail west of Beaver Road is shown as an “Administrative Road – Controlled Access” but don’t worry, it’s still a ski trail. Let’s hope for a snowy second half of winter and for some enjoyable spring skiing! 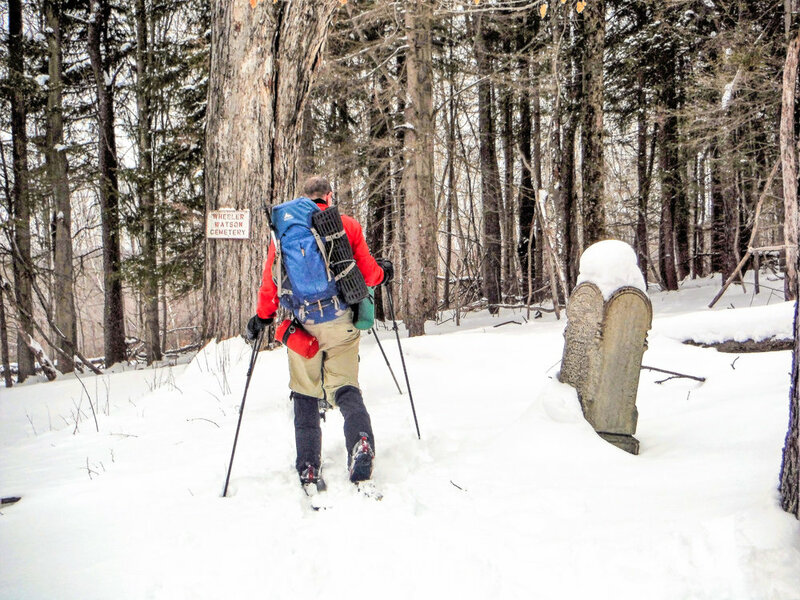 Rich Macha (adkpaddle@yahoo.com) of Albany is an avid wilderness cross country skier and paddler. He has spent 20 years in the ski and paddlesports business and has led many ski trips for the Albany Chapter of the Adirondack Mountain Club.